Make Checks payable to Trinity Arts Guild or Pay online with PayPal. Open to all regional artists. Selected entries must be delivered to the Trinity Arts Guild Gallery and must remain hanging for the entire show. Entries will not be accepted if they have been in a previous TAG juried show. Entries must have been completed since January 2015. Sunday, April 28, 2019 – Acceptance notifications will go up on the website at http://www.trinityartsguild.net. 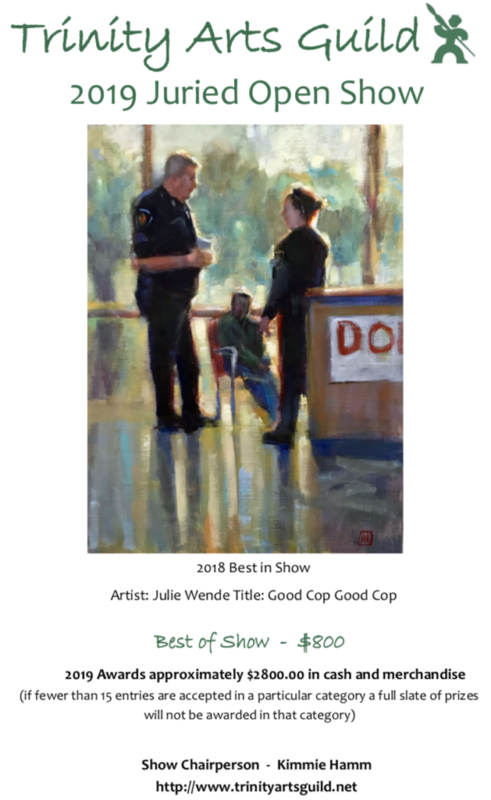 Friday May 17, 2019 – City of Bedford Arts Reception and concert on lawn.